THE SCHTICK: Paddington Bear sits down to enjoy one of his trademark marmalade sandwiches. But on spying an advert on a passing bus for Marmite, he decides to try something new. He enjoys his new filling but when he shares it with a pigeon, the bird goes berserk in disgust and causes a black cab to crash into a market stall. A stray watermelon lands on the head of a policeman, who takes Paddington home. THE BREAKDOWN: Paddington purists will be spluttering into their breakfast at the thought of the Peruvian bear forgoing marmalade for Marmite. But Unilever, which makes the savoury spread, wants sandwich-eaters (or more specifically, those who buy the family groceries) to undergo their own Paddington moment. Marmite is traditionally used on toast, which is being eaten less and less, so Unilever wants us to think of the spread in a different way - as a condiment in our lunchtime sarnies. "Squeezy Marmite is good to put on sandwiches because normal Marmite can tear the bread when it's spread with a knife," says Cheryl Calverley, Unilever's Marmite brand manager. 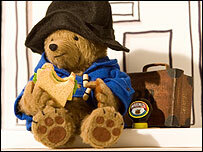 "Paddington is the most famous sandwich-eater around and has eaten marmalade sandwiches for 50 years. If he can change his habit, so can anyone." There is no pretence that this is aimed at children. This is nostalgia advertising, and the opening lines of narration are: "Paddington, you will remember from your childhood, always keeps a marmalade sandwich for emergencies..."
Marmite, which at 105 is more than twice the age of Paddington, has a strong advertising heritage and is about parents more than children. With this advert for a family-sized tube of Marmite, Unilever says it is targeting nostalgic mothers who grew up watching Paddington Bear and now commonly do the family's grocery shopping. Expect to see the advert during GMTV. Just as the 1970s Marmite adage held that it's a "spread you never grow out of", this subtly repeats the trick by rekindling childhood memories of Paddington. But it is the brand's newer mantra - you either love it or hate it, which has been in use since 1996 - that drives the narrative, as the pigeon's revulsion contrasts with Paddington's delight. The Love It, Hate It message has been a successful one with sales rising for the past three years and a section of the Marmite website devoted to its "haters". It takes a highly confident brand to acknowledge that some people don't like it, but it gives Marmite what Unilever calls "mass affinity". Even those that don't like the taste feel included and will talk about the advert and, by extension, the brand. It's also unusual for a product to name a rival in an advert, although Apple did so obliquely with its Mitchell and Webb I'm a PC adverts. Paddington takes out a generically-named jar of marmalade from his famous battered suitcase, only to put it aside unopened. And this is the controversial moment. Paddington and Marmite? That's not right. Marmalade is as much part of Paddington as his duffle coat and hat. Karen Jankel, of Paddington and Company Ltd, says there were initial doubts when Unilever approached them. "There certainly were reservations until we realised the idea behind it - Paddington trying something different. The thought of Paddington changing to Marmite would be wrong because he's so wedded to marmalade and will continue to be so. "But Paddington is always interested in trying new things and that's why he gets into the scrapes he does." Michael Bond, who is writing new material for Paddington's 50th birthday next year when the bear will be back on his marmalade diet, has penned some scripts for the next instalment in the £3m, 18-month campaign. 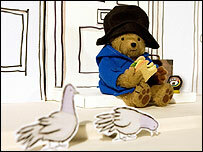 It's the first time the bear has been used in TV adverts, and follows Camberwick Green being used to plug Quaker Oats. The official Paddington website (see internet links, right) has a fuller explanation for fans bewildered by his change in taste. What may placate them is the whiff of authenticity about the highly polished production, with the animation, narration and music reminiscent of the original 70s series. All that's changed (apart from the sandwich filling) is the voice. Michael Hordern passed away in 1995 and is replaced by Paul Vaughan, whose voice has a similar warmth and authority born from decades of radio presenting and voiceovers. As in the 70s, it was shot on a 16mm film using stop-motion techniques, so for each frame the puppet was moved slightly by the motion animator. The puppet, which interacts with two-dimensional characters, was built specially, with matching proportions, colours and materials to the original. The shoot took seven days. The old magic is there, certainly, and that may be enough to win over Paddington-lovers. But there may be some who prefer their childhood favourites innocent and commercial-free. Anything that introduces a new audience to old classic should be supported. I have especially enjoyed Quaker adverts featuring Windy Miller. Such wonderful humour without Windy uttering a single word. My favourite being the one about jogging. 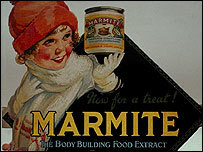 As for Marmite, I'm firmly in the "Love It" camp and have enjoyed their ads using that theme since they began. I look forward to enjoying this latest installment in the series with relish (or should that be Marmite?). I am saddened by Paddington's trip to the other side. He eats marmalade sandwiches and nothing else (although I imagine he enjoys a cup of earl grey tea of an evening). Surely it would have been better to have him (Paddington) tasting the marmite, not liking it and going back to his marmalade!? Marmite get the coverage (no pun intended) and Paddington stays true to his roots. I would have certainly rated the brand more highly if they felt they had the confidence to follow this angle. As a marmalade loving, but Marmite hating individual, I find it difficult to believe that Paddington would abandon his usual sandwiches for the salty tasting Marmite! I believe that he has managed all these years on a diet of marmalade sandwiches, to change now would not be good for his digestion! Good on you Paddington. My daughter won't eat anything but Marmite sandwiches - all our family love it. In fact I used to have to pay £6 per jar from international food shops when I lived in Rome, it was like gold to us. What a ridiculous concept. Under no circumstance should a bear be let loose anywhere near Marmite, Mrs Small bears the scars of that particular folly. No reason at all why he can't have Marmite (which I like), but I had to laugh at the mealy-mouthed corporate justification by the company that owns the brand, after taking the lucre. Why shouldn't Paddington have a change? He must be a bit fed up with Marmalade sandwiches after all this time. Personally, I love it... but my husband hates it. It's great in toasted cheese sarnies - yum yum! At last a triumphant return for the sandwich-chomping bear. Having been an avid fan of both Paddington and Marmite since being a young slip of a lad this has been the best possible news I could possibly have imagined! I have been trying to get the local bears here to give up the marmalade but to no avail, hopefully when they see this new advertisement then they will follow their idol, the young bears here are very impressionable and whatever Paddington does so do they. Anyway, as I am always saying to them; oranges are not the only fruit.